You think we have trouble with the trash part of the HOA amenities--check out the trash chubaca on this woman's blog!! I hardly think trash cans in the driveway was worthy of a typewritten letter and the cost of postage. However, I have since moved them to the side of the house where they normally reside. I am tempted, though, to take up my sisters' offers to help. One said said she'd pimp out my trash cans with rhinestones and boas and glitter, and the other said she'd sew a set of trash can cozies to cover them up. 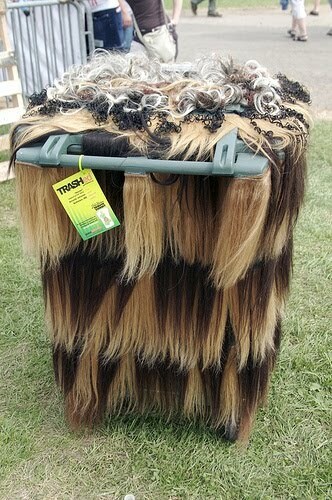 Or maybe I'll just cover them up with hair extensions, like this person did.